Last week, a black college student said she scammed Republicans out of thousands of dollars by pretending to be a Trump supporter who was rejected by her parents. Quran, who goes by @chckpeas on Twitter, is an art history student at Howard University. White Republicans are very eager to embrace black Republicans. Since America’s political divide is defined by white supremacy, white Republicans want to find the metaphorical “black friend” to prove that their ideology isn’t fundamentally racist. Considering that exit polls show that very few African Americans voted for Donald Trump, they are also pretty desperate to find some black people to ease their white guilt. 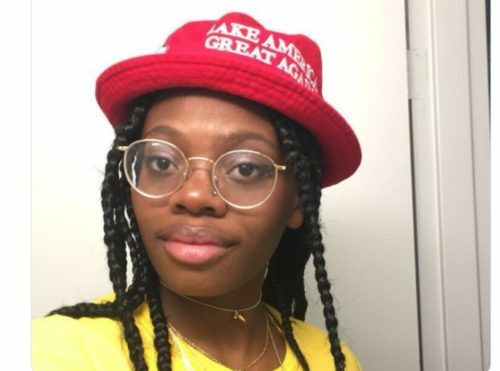 Quran said that she was hanging out with friends and decided to tweet a pic of herself in a MAGA hat to make fun of people like Kanye West who “walked away” from the Democratic Party. The reaction wasn’t what she expected, though. Quran then posted screenshots of text messages from her “mother” (she later admitted that she sent the texts to herself) cutting off financial support because of her newfound conservative ways. “I was at 900 likes. I told my friend, ‘I feel like this is gonna blow up. Let’s try and get some money off these dumb, rich Republicans,” she said. So she set up a GoFundMe (which has since been deleted) to raise money for tuition. And she got some support. It only took a few hours, though, for Quran to tell the truth. Quran has gotten a lot of cheers on Twitter. And she also got some hate from Republicans, who were quick to show their true colors once they found out it was a scam.